Black Panther actress, Lupita Nyong'o has confirmed the screen adaptation of Chimamanda Adichie's acclaimed novel, 'Americanah'. News Agency of Nigeria (NAN) reports that Nyong'o said this in a recent Vogue magazine interview, adding that fans do not have to wait much longer for the adaptation. She said, "My dream project is finally getting to make Americanah [a 2013 novel by Chimamanda Ngozi Adichie], which is looking very, very likely. "It's going to happen in the near future and it's been a long time in the making and I'm very, very ripe and ready to get into that for sure." 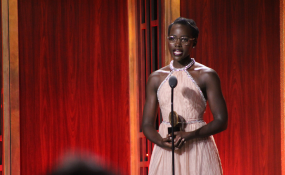 NAN reports that Nyong'o purchased the film rights to 'Americanah' in 2014 and immediately collaborated with fellow Black Panther's castmate, Dania Gurira to write the screenplay. Fans expressed delight that the two filmmakers who are not Nigerian - Nyong'o (Kenyan) and Gurira (Zimbabwean)- were interested in doing quality research for a very Nigerian novel. This will mark the third time Nyong'o and Gurira work together. Prior to playing Nakia and Okoye in Marvel's Black Panther, Gurira wrote Eclipsed -- the play that landed Nyong'o her first Tony nomination. There were early reports that David Oyelowo was to co-star with Nyong'o in the adaptation with Brad Pitt producing through his Plan B company. 'Americanah' follows the story of two young Nigerian immigrants, Ifemelu and Obinze, who face a lifetime of struggle while their love story endures.